At Pear Stairs we make staircases to suit all budgets, so you’re bound to find something you can afford. If money is tight, we can suggest several practical options for reducing the cost of new stairs without making any noticeable difference to their appearance. Swapping a premium timber for a less expensive one can work wonders for your wallet. Hemlock makes a great substitute for oak, while sapele looks very similar to mahogany. If you’re intending to paint parts of the staircase, order those particular components in an economical softwood such as European redwood or whitewood, as the timber won’t be visible afterwards. Another option is to manage without using wood altogether for certain areas of the staircase. If you’re going to carpet the stairs, for example, much of the structure will be concealed, so you could get away with fitting MDF treads and plywood risers. Choosing a fairly standard design will also help you keep costs down. While all our staircases are made to measure, some styles are more expensive for us to produce than others. Stairs with cut strings, for instance, take longer to manufacture than those with closed strings, so come with a higher price tag. The same principle applies to open tread and closed tread staircases, with the open tread style being more expensive. 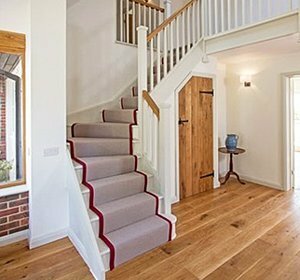 Many home-owners opt for a mixture of timbers - a popular compromise is to use American white oak for the handrail and newels, and softwood for the remainder of the staircase. A great way to explore different cost options is to have a go at designing your own staircase using our online planning tool, the StairCreator. You can try out different materials and designs, and watch the price go up or down each time you change your requirements – ideal for keeping control of your budget.